Please refer to our stock # 10509 when inquiring. 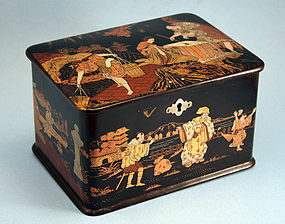 Fine Antique Japanese Black Lacquer Tea Caddy, rectangular with rounded corners with polychrome and gilt decoration of figures engaged in various tasks. Circa 1870.